Here at the University of Oregon, it’s no secret that we’re fans of Marcus Mariota. The man raised Oregon Football to new heights, all the while never forgetting to flash his beautiful smile. I mean come on, people! So, when something new happens in this man’s life, we have the right to know about it! We sat anxiously as we watched him lead drive after drive as the score built over Florida State. We cried with him as he thanked his family in his Heisman speech. We scoured the Eugene area for the police officer who ticketed this Adonis (This one didn’t actually happen, but it’s fun to pretend). In short, we’re big BIG fans. So, for all of you Marcus fans out there, here are the top five things you need to know about your favorite Hawaiian right now. But what wasn’t expected by all was Mariota’s excellence in the passing drills. Mariota went eye to eye with Jameis Winston throughout most of the passing drills, and most experts believe that Mariota performed well beyond expectations. Although Winston is still the likely number one pick, Mariota at least gave Tampa Bay something to think about. 2. If he’s not going No. 1, he’s going to fall. At least, that’s what the experts think. The reality is that outside of Tampa Bay, there isn’t really a team drafting in the top 5 whose priority is at QB. The New York Jets would probably love to take him with the sixth pick, but if for some reason they don’t, Mariota could slide to St. Louis at 10 or even Cleveland at 12. But we all know where we want him to go. Who’s that guy on the left?! 3. 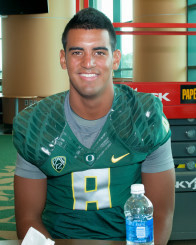 Mariota was his generally darling self during interviews. “He says all the right things, he dazzles on the football field, but gosh Mel I JUST DON’T KNOW IF HE’S READY TO BE AN NFL QB.”- Todd McShay, ESPN NFL Draft Expert. Although the above quotation is fictitious, that’s seriously what it’s starting to feel like. After acing his interviews, Mariota only boosted his draft stock. At this point though, it’s feeling like the Hawaiian might have to walk on water before the Bucs take him with the first pick. 4. The interest is there for Philly, but the reality is it’s going to be tough. We all know Chip Kelly wants his former prodigy. I mean come on! For Mariota to be drafted into the system that just helped him win a Heisman, I might be willing to give up my first born child! The reality is, though, it’s almost impossible. For Philly to move up 18 or so spots in the draft, it would almost certainly have to give up LeSean McCoy, as well as a bounty of future picks. Although Mariota would likely excel in Kelly’s offense, the Eagles’ management would have to do a serious cost-benefit analysis to decide if Mariota is worth it. We here in Eugene know the answer! 5. Pro Day is approaching rapidly. Mark your calendars, folks. March 12th is Oregon’s Pro Day, and essentially the last day for Mariota to make a serious impression on NFL scouts. Although Winston appears to be the consensus No. 1 pick right now, a lot can change in two months. If Mariota comes out two weeks from now, makes some throws, and shows he can operate under center, then the No. 1 pick will be wide open. So, there you have it. Is it an obsession? Perhaps. Should you be embarrassed over your love for Marcus? Certainly not. If there’s one thing to say about Oregon’s next year’s starting QB race it’s this: Whoever wins is going to have some BIG shoes to fill. 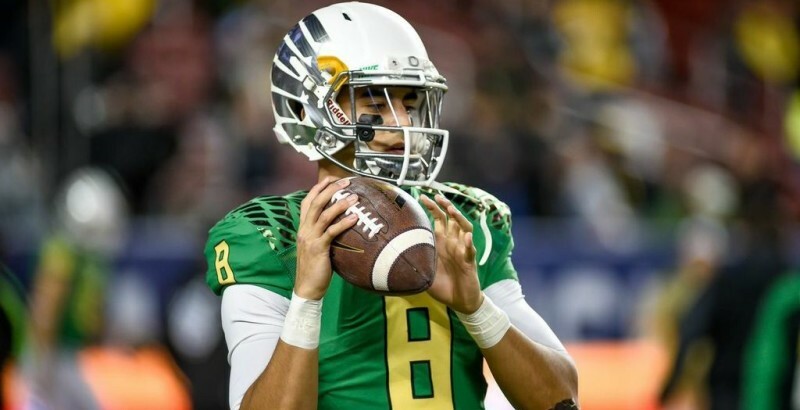 Stay tuned to FishDuck.com for more Mariota and Oregon related news!